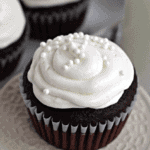 Red Velvet Cupcakes ~ Perfect Red Velvet Cupcakes topped with an amazing cream cheese frosting! Combine flour, cocoa, baking soda and salt in large bowl. Combine oil, applesauce and Truvía® Baking Blend in a separate large mixing bowl. Blend in eggs. Carefully add red food coloring and vanilla while mixing at low speed. Combine the buttermilk and vinegar. Then add half of the flour mixture and half of the buttermilk mixture to the oil mixture at a time and mix just until combined. Fill paper-lined or greased cups 3?4 full with batter. Bake for 20 minutes or until a toothpick inserted into the cupcakes comes out clean. For the frosting mix cream cheese and Truvía® Baking Blend at low speed for 1 minute. Add the vanilla and mix for another minute at low to medium speed or until creamy and smooth. Add 1 teaspoon of milk, if desired, for thinner spreading consistency.